John Cobb Pittman of Birmingham, who served on the Board of Trustees of Samford University for 62 years, died April 25, 2015. He was 92. He was a 1944 graduate of Samford, where he met his wife, Marjorie Holcomb Pittman, who died in 2007. Pittman’s long career as a life insurance executive began soon after his service as a U.S. Marine on Okinawa during World War II. A producer, general agent and managing partner with New England Mutual for 32 years, he completed his career with the company as a senior regional vice president. He qualified multiple times for the Million Dollar Round Table. During his tenure on Samford's board of trustees, he served in many positions, and was its chairman twice. 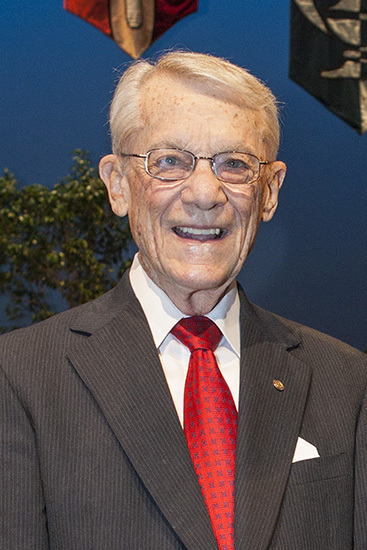 The John C. Pittman Spirit award was established in 2004 to honor his 50th anniversary as a Samford trustee. The annual award recognizes a graduating senior who has exhibited serious commitment to being a student, honoring Christ, maintaining personal health and involvement in student life. He was a founding member of Brookwood Baptist Church, where he was chairman of the Board of Deacons and a longtime Sunday school teacher. His community and civic causes included the United Way, which he served as campaign chair in 1986. He was an avid golfer and bridge player. Samford President Andrew Westmoreland paid tribute to Pittman’s genuine and steadfast faithfulness. “Finding one word to encompass the qualities of John Pittman would be an impossible task, but if pressed to offer one word, I would choose ‘faithful,’” said Westmoreland. “He was faithful in his devotion to his family, faithful in his relationships with clients, faithful to his devoted friends, faithful in his commitment to Samford and the other great causes of his life, and faithful in service to the God that gave him life and strength and purpose,” he said. Pittman is survived by a daughter, Carol Pittman Mitchell, a son, David Pittman, five grandchildren and five great-grandchildren. A memorial service will be held Thursday, April 30, at 3 p.m. at Brookwood Baptist Church. Visitation with the family will be from 1:30 to 3 p.m.
Memorials may be made to the John C. Pittman Scholarship Fund, Office of Advancement, Samford University, 800 Lakeshore Drive, Birmingham, AL 35229 or to Brookwood Baptist Church Construction Mission Project, 3449 Overton Road, Birmingham, AL 35223.